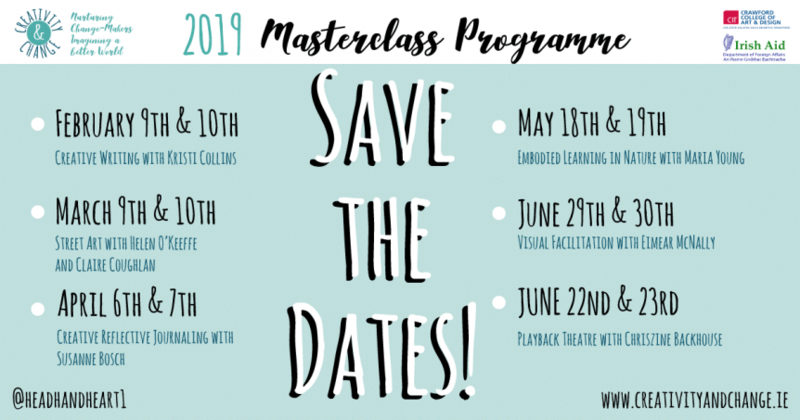 Creativity and Change masterclasses are an opportunity for inspirational, intensive and in depth engagement over one or two days. Delivered by facilitators with specific expertise and experience, the programme is designed around the identified gaps and expressed interests of practitioners. Each masterclass is a deep dive into a specific method that can be used to explore change-making, global citizenship and social justice. Fees are subsidised by our partner Irish Aid in order to make these courses affordable and accessible to all. They will all take place in inspiring locations around Cork City.